Our worship is spiritually inspired, following the rubrics of the Book of Common Prayer. On Sundays the Eucharist is celebrated at 8 a.m. with the Rite One service, and at 9:30 a.m. with Rite Two. 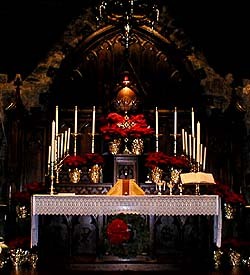 On Wednesdays there is a Eucharist Service at 10:00 a.m. The Eucharist is also celebrated on Holy Days. Everyone is welcome at God's table. Healing Ministers are present at services on the first and third Sundays of the month. On the last Sunday of the month, the youth of our church participate in readings and music at the 9:30 a.m. Family Sunday Service. The entire Sunday service is printed in the bulletin and distributed to the congregation at the beginning of the service. 5:00 p.m. - Candlelight Holy Communion designed especially for families. The Cherub and Junior Choirs will offer special music and Father Stephen Rozzelle will give a meditation. 10:30 p.m. - Festival Holy Communion. Music by the Adult Choir and sermon by Father Stephen Rozzelle. Hypoallergenic incense will be used at this service. 10:00 a.m. - Festival Holy Communion with a meditation by Father Stephen Rozzelle. Sunday, November 24, 2019 - 8:00 a.m. and 9:30 a.m. The Sunday before Thanksgiving church is decorated with fruit and vegetables to be shared with shut-ins.